Written seemingly as a counterpart to “She’ll Drive the Big Car,” “Fly” (a desperate husband’s tale, with another A major refrain) was knocked down to a bonus track. By this point in Bowie’s career, one expects this sort of thing. Given a choice, he’ll always cut a self-penned track from an album before a questionable cover (see “It Ain’t Easy,” “Across the Universe,” “Bang Bang,” etc.). That said, “Fly” would have been a tough fit on Reality, even more than “Queen of All the Tarts.” Despite its depressive lyrical scenario, it’s a cheery track, a clatter-fest in a hurry to get somewhere. In keeping with Bowie’s apparent desire to sneakily remake Never Let Me Down, “Fly” is one of the most “Eighties” Bowie tracks since, well, the Eighties. The main guitar riff (Carlos Alomar, see below) seems a bit derived from Devo’s “Whip It,”* while a holiday camp keyboard is just one voice in a mix overrun by stray instruments. There are even some little party bits, like the “dying for the WEEKEND” tag. A father’s in his driveway weeping in his car, watching the TV play to an empty room in his house. His wife is bored or distracted, his son might be on drugs. The kids down the street are playing “on their decks”** in the garage, working up a set for an “all-night rave” (seems like Bowie hasn’t been getting out too much in the early 2000s). None of this seems that tragic, even the verse about some kid overdosing. 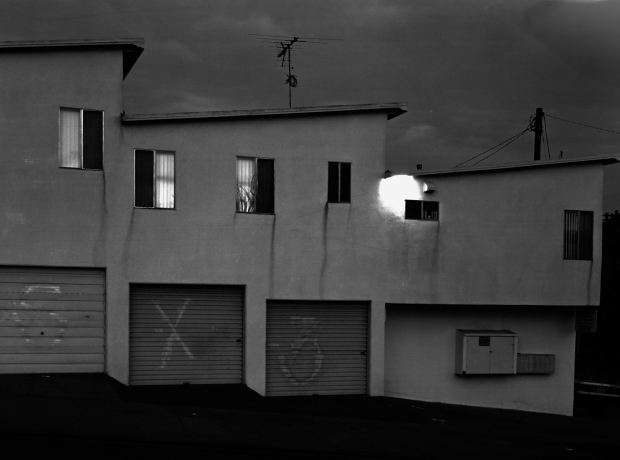 It’s more like Stewart Copeland’s “On Any Other Day“—a suburban dystopia played for laughs. It’s fun to see Bowie back in suburbia again, for what would be one of his last visits. As a kid in Bromley, like the father in “Fly,” he took refuge in his mind. He stayed up in his room and read Beat novels, looked for UFOs, played records, scrawled in notebooks, practiced astral projections. He once described his teenage home as having to pass through purgatory (his parents’ living room) to get upstairs into his private haven. Dana Gillespie recalled how cold the Jones’ house was—she found it a loveless place, a house without life, as if Bowie’s parents were actors who went off stage when no one was around. So Bowie stayed in his room until he could fly. Away he went: Haddon Hall, Chelsea, Los Angeles. Berlin, Montreux, New York. As Momus wrote, much of these “last” Bowie albums are Bowie regarding his aging contemporaries as one would creatures in a zoo. What’s it like to have failed, to have fed on dreams but starved instead? Even his own success had nearly snuffed out a few times. He’d rolled the right number, but what if he hadn’t? Hence the refrain of “Fly,” Bowie taking grandiose refuge in his dreams (in the last refrain, an unexpected D# minor chord (“but I can fly”) rattles the sequence, making Bowie alter his flight path to stay in the air). Dreams are in a provisional tense, offering that the present isn’t real, that the future isn’t set. But dreams are lies, of course. Those that come true are simply lies we’ve willed ourselves (and other people) into believing. In spring 1974, a young British singer/songwriter met a guitarist at a session in New York the singer was producing for Lulu. Bowie found in Carlos Alomar his ambassador to the New York R&B and funk scenes; Alomar saw Bowie as a way off the R&B circuit. The timing was perfect. Having split with Mick Ronson, Bowie needed a new sous-chef. But he didn’t want another Ronson (if he had, he’d just have kept Ronson). He wanted someone who kept behind the scenes (no worries that Alomar would get more fan mail than Bowie) and who could handle new twists in Bowie’s songwriting. To Ronson, Bowie typically presented lyrics, top melodies and even guitar or basslines—at the least, Bowie would offer a complete chord sequence. Ronson’s role was to smooth, kick up, embellish and refine, to find counterpoints and add effects, to broaden and sweeten the song, to give it a public face. By Station to Station and Low, Alomar was charged with creating the basics of a song. Bowie would offer some chords, a provisional title, some mood directions, and let Alomar take it from there. Bowie would monitor him rigorously and approve or discard whatever Alomar came up with, and much of the work was now in “post-production” (Alomar rarely heard Bowie’s vocals until the record came out). But essentially this was songwriting as delegation: Bowie as foreman/engineer, Alomar as shop steward. Scott Walker once described Bowie’s work as being something like a factory: He comes up with the goods and makes sure of delivery all down the line. Bowie couldn’t have done this without Alomar, who was his translator, research team, legwork man and studio engine. Nearly becoming a victim of Bowie’s changing tastes in the early Eighties, Alomar persevered, playing on Tonight and Never Let Me Down, touring Glass Spider. He hung on until Outside and the subsequent tour, which finally made him know he was done. Even after that, he added a few guitar lines to Heathen and Reality tracks. Towards the end, Bowie spoke of Alomar a bit coldly (“Carlos is always good value for money,” he said on a webchat in 2001), and the two haven’t reconnected yet in Bowie’s current revival. Alomar’s lead riff on “Fly” is barbed with hooks, as always, but it’s a rather hollow last act, like Ronson’s farewell solo on “I Feel Free” in 1993. No matter. What’s important is that Alomar got a last act, and that he’s slowly won the recognition he deserves. Let’s hope “Fly” isn’t the end of Bowie and Alomar’s days together. But if it is, hail and farewell, Carlos Alomar: Bowie’s finest collaborator. * Nicholas Pegg suggested the riff owes a bit to Abba’s “On and On and On” too. 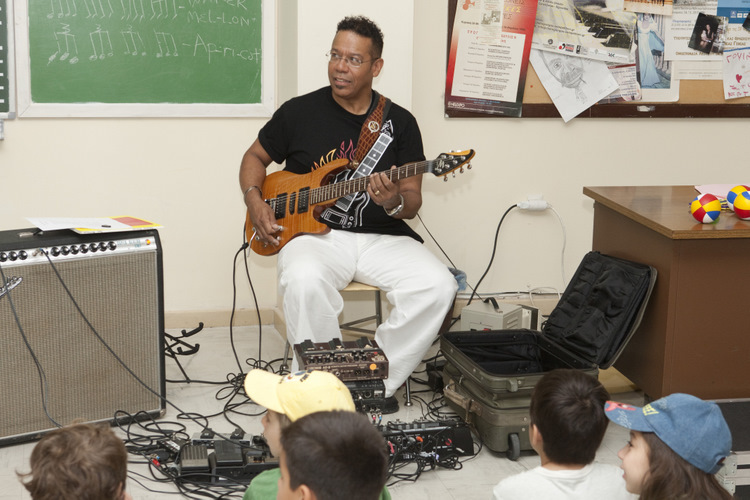 Top: James Welling, “Apartments, West Los Angeles,” 2003; Carlos Alomar teaching kids music at the Summer Science and Rainbow Camp, Anatolia College, 2011.